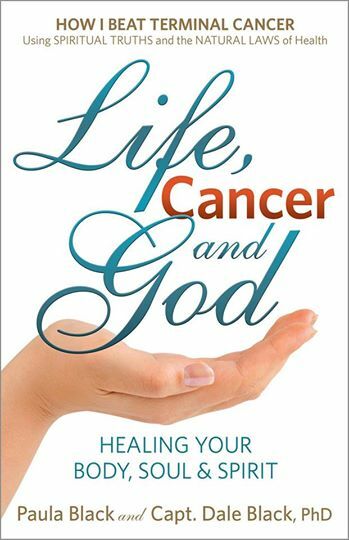 The Body-Soul-Spirit Approach For Treating Cancer and Chronic Diseases — Paula Black - Author of "Life, Cancer and God"
I have learned that the most effective way to fight disease is to treat the whole person – body, soul and spirit. God created us in His image: we are a spirit, we have a soul (our mind, will and emotions) and we live in a body. By treating the entire person at the root cause of sickness and disease is the only way to be permanently well. In my prime of life I heard the dreaded words - "It's Cancer." I researched everything I could and eventually found a combination of methods that treated the root causes of my disease, not just symptoms. Many have called me a cancer survivor. I reject that label. I didn't simply survive cancer - I am cured of cancer. When I was diagnosed, my husband Dale became my cheerleader and my counselor. His experience as the only survivor of an airplane crash gave him an astounding ability to see life through a spiritual lens, along with a history of overcoming life-threatening injuries. Dale became my full-time researcher and he put those skills to valuable use, digging tirelessly for the information I would need to reverse my disease. We learned that the most effective way to fight disease is to treat the whole person – body, soul and spirit. God created us in His image: we are a spirit, we have a soul (our mind, will and emotions) and we live in a body. Each of these parts plays a different role, yet they interconnect. Each part has a great effect on health or sickness, on life or death. And each part affects the other parts for good or bad. This means that even when sickness or disease is apparent in your body, the illness may be rooted in your spirit or your soul. Thus, for permanent vibrant health, you must address all three parts—your spirit, your soul, and your body. The spirit refers to your spiritual heart, not your physical heart. You are a spirit being, created in God’s image. God is a spirit. The real you is your spirit, not your body or mind. You also have a soul, consisting of your mind, your will, and your emotions. Though it’s probably the least understood of the three parts, the soul has a profound effect on your life in a myriad of ways. People commonly believe the soul and spirit refer to the same thing—but they do not. According to Scripture, they are clearly different, yet both are eternal parts of your being. You live in a body that exists to house your spirit and soul. Your body allows you to interact with the physical world in which you live. The body is the easiest part to understand because you can see it and touch it. You can literally feel your body, inside and out. For example, if your toe hurts or your head aches, you know your body is afflicted. Your body is also the part of you that others acknowledge and with whom they interact. If you don’t consciously adjust your way of thinking, you can mistakenly believing that your body is who you are. But your body is where you live—not who you are. You—the real you—is your spirit. Think of your body like you do your car. It’s the vehicle you use to get around in. When people who know you see your car coming, they say, “Here comes so-and-so.” They recognize you by the car you drive, but you are not your car. Similarly, you need a physical vehicle—your body—to carry your spirit and soul through this natural world. In summary, you are a spirit, you have a soul, and you live in a body. Because each of these three parts interconnect and interrelate, one part cannot be affected without the other parts responding either positively or negatively. When most people think of sickness or disease, they think only about the body. But unforgiveness, continual stress, or feelings of fear and anxiety—which are spirit and soul issues—can have a very detrimental effect on our physical bodies. If you are sick and want to get well… or if you are well and want to prevent disease… you need to understand and address your whole person—body, soul and spirit.